And all I could ask God is "WHY?" My love still lives on - it will never go away. This special day was created by Deborah Barnes – author, award winning blogger, and cat advocate in tribute to her cat, Mr. Jazz, who she had to say goodbye to on August 28, 2013. She shared the journey of letting him go in her most recent book, “Purr Prints of the Heart: A Cat’s Tale of Life, Death, and Beyond,” a warm and heartfelt book that is written in the wise and comforting voice of Mr. Jazz himself as he shares his life and death journey to offer guidance and understanding through a cat’s perspective as to why sometimes letting a pet go can be the greatest gift you give them. A special event page for Rainbow Bridge Remembrance Day has been created on Facebook so that people can share blog post links, pictures, poems, favorite memories, etc. Please click here for the link. The loss of Truffles was hard, even for us. Extra purrs for you today. Beautiful poem. I have a feeling that today will be a hard day emotionally for all of us participating. We'll never know the reason why things happen the way they do. Purrs to you as you remember Truffles today. Beautiful poem. Truffles was a sweet kitty. RIP Truffles. TW will definitely be crying all day. Unfortunately I couldn’t participate. Such a lovely tribute to your special angel. 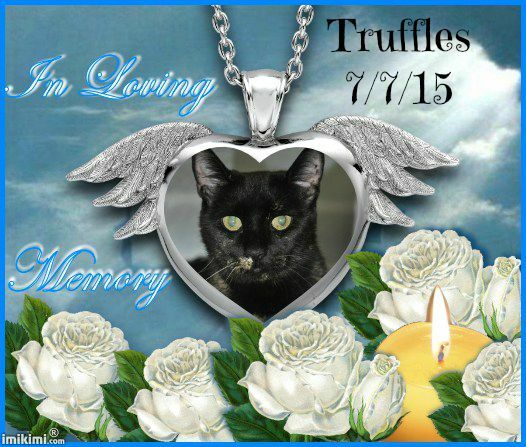 Hugs, purrs and prayers to you, as you remember sweet, precious Truffles with love, today and always. That poem was lovely and we know Truffles will always have a special place in your heart! Way too young to have left you. I think losing them suddenly is the hardest. Much love to you today. (((HUGS))) We're sending purrs to Angel Truffles. We too grieve for you. Truffles was gone far too soon.